Hey guy’s sorry its been so long, the studio has been off the charts busy and that also means I’ve been off the charts busy, but I’m here now and I’d love to chat about the studio. We have had so many holidays lately and even more are coming up. We had classes for Groundhogs Day, Valentine’s Day, Galentine’s Day, and Mardi Gras is just around the corner. Our talented teacher Mike started the month with an incredibly cute groundhog cake class and everyones tuned out so good they looked like professional cakes. I would have bought any of them had they been in a bakery. A few weeks later we had literally five different Valentine’s Day themed classes, one being a kids class taught by instructor Chayla Turner, and another being the anti-Valentine’s class where many of the Galentine’s attended. For those of you unaware of the new Galentine thing, it is where gals get together and celebrate the holiday vs. being with a partner. Each Valentine class was a huge success, with a few completely selling out. Whether it was the Anti-Valentine’s Class or the Love Inspired Unicorn Class everyone left with smiles on their faces and amazing cake creations. It truly was the time of the season for loving. I can’t wait to tell you guys about our future events, including our Celebration of the 30th anniversary of The Little Mermaid that is soon to come! Stay tuned for more at the studio. Till next time, Kristen. New Year, New Fun at My Make Studio! Hey guys, how was your New Years? Ours was pretty great, and we even ended the year with our 100th class! We also hit our 200 mark for selling gingerbread houses so we are pretty excited. 2018 was a pretty good year for us, we started kids classes which was a huge success, we went to a couple of markets, and even made it to the media a few times via news, magazines, and radio! It’s been a great year for us, and we are excited to see what 2019 holds for us. Just this past weekend we had one of our kids classes taught by Chayla Turner, and it was amazing per usual. She knocked it out of the park teaching them to make dog cupcakes, flower cupcakes ,and more including some really cool and fun techniques. The whole class was wonderful and it was so nice to have the kids learning side by side with their parents. We are really excited for next months kids cupcake class because it is valentines themed and the cupcakes are super cute. Lately it’s been mad with creativity and fun at the studio. This past weekend we not only had fun at the studio, but we also had fun attending our annual Gingerbread House Competition, teaming up with iHeart Radio’s, The Modern Eater. Now this isn’t your typical gingerbread competition because all the contestants are local brewery’s, so if you haven’t had the pleasure of listening the The Modern Eater and don’t understand how they are connected, then let me explain. Not only do they sponsor a few local brewery’s, but they also go around doing events for brewery’s while putting it all on the air. So, with that being said, they got to enter the competition and like last year we were invited to team up with them, so it was time to make an amazing plan. Now I know what your thinking, how hard can it be to come up with a cool design for a gingerbread house? Well the answer is, HARD! Last year we even made the entire Denver cityscape and we only got second place, so we knew this year was going to be a tough one. After brainstorming and throwing a couple ideas out the window, we finally came to the conclusion of making The Modern Eater’s kitchen. It took a couple of tries and a couple of walls ripped out, but we finally came up with the perfect design. So Saturday the 15th was the big day! There were so many other people at the competition but we were confidant because no matter what happened, we would be happy (but we really did want to win.) How the judging works is everyone votes on whose house is the best. Our team was pretty confident but it wasn’t over, so we took the time to relax and checkout everyone else’s house while also spending some time talking on the air. By the end of it we had realized we did it, we actually won the competition! Of course we let The Modern Eater keep the trophy but we got some good pictures with it. We can’t wait till next year’s competition, and hope we do just as good if not better. Winter Fun at My Make Studio!! It’s fun fun fun at the studio this winter! We have had so much happen this winter, from the gingerbread houses, to the classes; This winter has been super lit and it’s only just begun! But recently, we had our first ever kids holiday class. With kids classes being new to My Make Studio in general, this one was a huge success. So huge in-fact that we were sold out, with every single chair sat! We were so excited with our turn out and with the joy we were able to give to so many people. I think the kids were very pleased with their results as well. 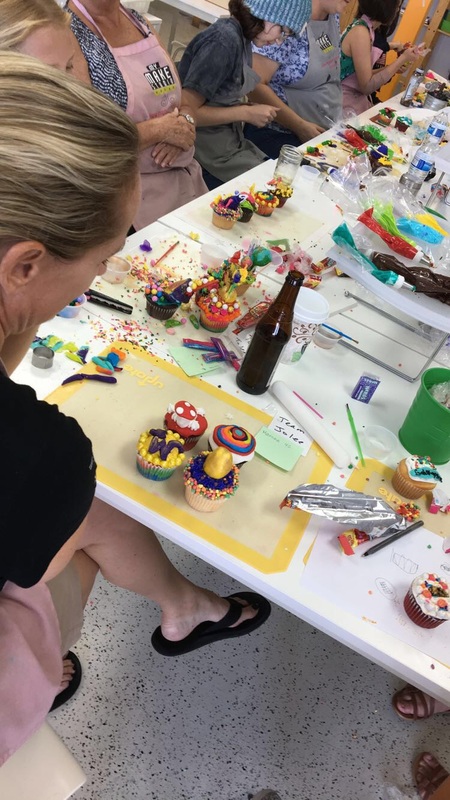 Our instructor Chayla Turner taught the kids to make super cute cupcakes including a fine frosty the snowman and even the Grinch! I’m not sure if everyone knew they were making the Grinch but they all lit up like Christmas when it was time to make him. Needless to say My Make has been having a great time this winter and I can’t wait to share our future event’s with you all. Until then stay warm friends! Gobble, Gobble, Gobble It's Turkey Time! Happy Thanksgiving everyone, I hope you’re all spending it well! We at My Make are closed today but we sure enjoyed getting ready for the holiday this weekend with Mikaila Riehm and her Turkey Carving Cake Class. It was such a blast and everyone was so impressed with their cakes. In fact many didn’t even know they had it in them. “I’m surprised it turned out to actually look like a turkey, and the peas and carrots were surprisingly easy to make!” -Anonymous. During this class everyone learned how to not only decorate their cake to look like a turkey, but they also learned to carve the cake, crumb coat the cake, and fondant the cake. This is such a treat because there was so much to learn and so unlike any of our other classes we’ve ever had. The best part is many were able to use their cake for their Thanksgiving desert today, so many had two turkeys at the table. We are so pleased with how our classes are going and we are so excited to see what comes this upcoming winter. Stay tuned for more happening at My Make Studio, and stay safe this Thanksgiving! My Make Studio Has Become Totally Wicked! 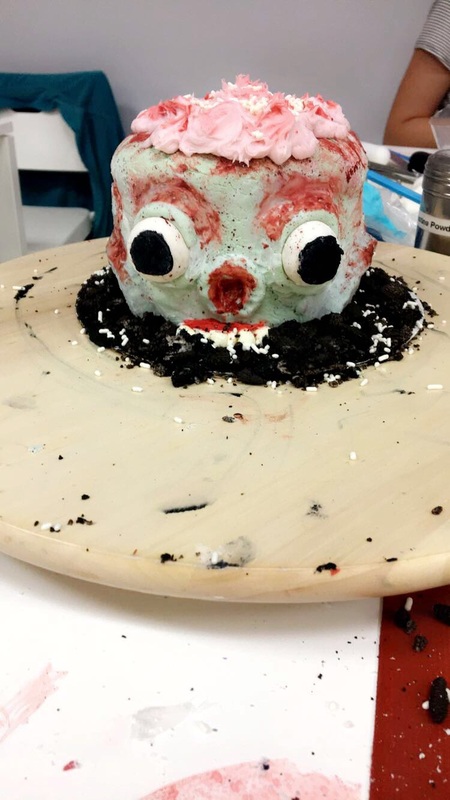 This week, instructor Chayla Turner totally knocked us off our feet with her devilishly amazing Gory Cake Class! This class brought some new faces and some old but all were thrilled with their cakes! 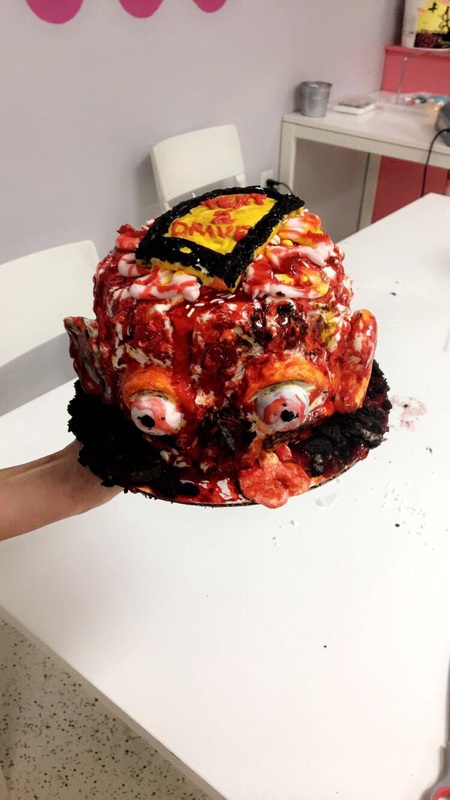 However, this wasn’t your typical cake, as it allowed our MAKE artist to explore their wicked side and not feel guilty for making it messy. Another thing that separated this class from the others is the fact that everyone was able to completely fondant and sculpt the cake to their liking where as most cakes have specific instructions. It’s really nice to see faces that enjoy the spooky season as much as we do. I’m so glad October isn’t over and we still have some more spooky classes left. Stay tunes to see what else is happening in the studio! My Make's First On Site Spooky Halloween House Event! This past Sunday we hosted our first on site Spooky Haunted House event and let me tell you, it was a wild blast! We were invited to attend Gabriella’s birthday with our limited time only Spooky Haunted Houses. So of course we came with all the bells and whistles which included frosting, and fondant but for this particular event we also brought our special Halloween creepy candy! Everyone that attended had a spooktacular time, and so did we! What a great start to our spooky season, we can’t wait to see what other fun October brings! For more happening this month check out our EVENTS page! 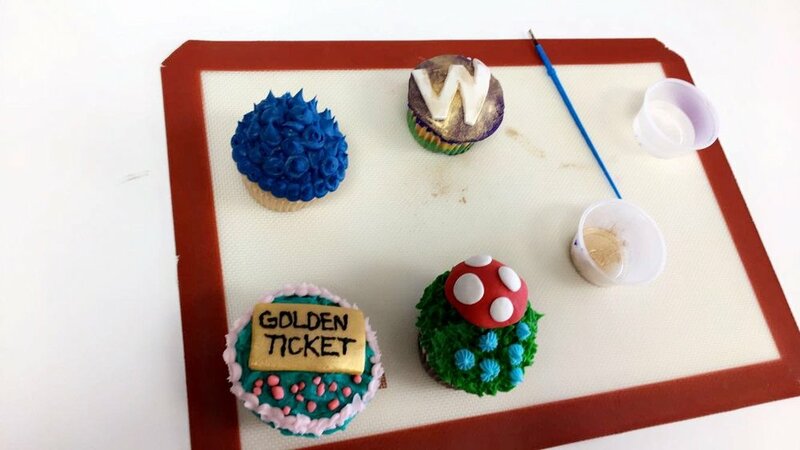 Willy Wonka and the Cupcake Battle! 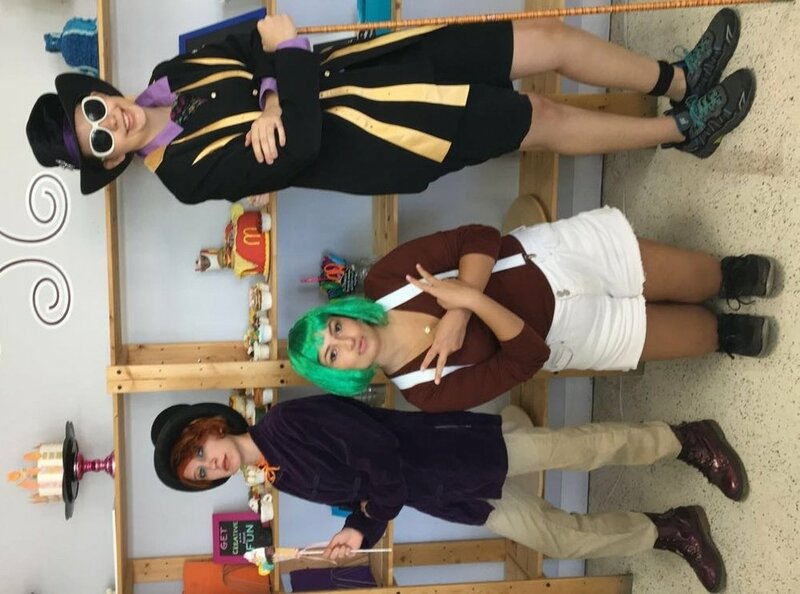 Recently we held one of our wonderful cupcake battles featuring Willy Wonka! We had people of all ages come and enjoy this wonderful event. 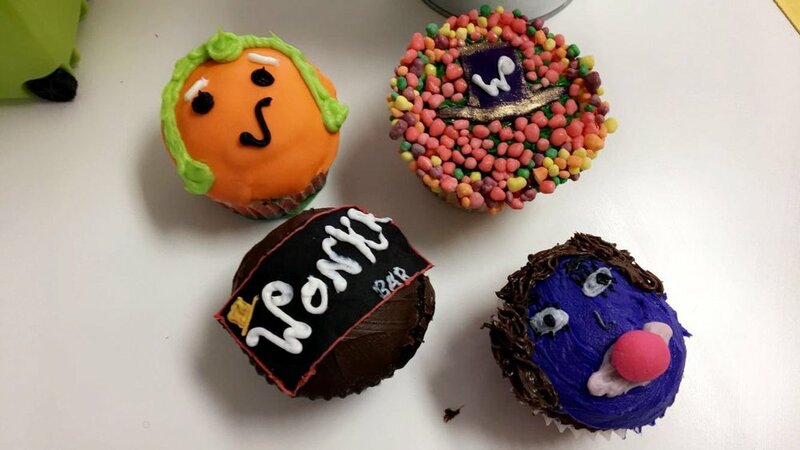 Since the theme was Wonka they had to incorporate Wonka into each of their cupcakes judged and had to involve some type of Wonka candy. We did provide them with Wonka candy options, as we didn’t expect them to bring their own! We aren’t that heartless. Then we gave everyone an hour to decorate 4 cupcake. There were so many wonderful cupcakes, it sure was a tough one to judge! In the end we had to pick winners from each age group and they couldn’t have been happier. Our staff also enjoyed the event, with everyone coming dressed for the occasion. It was truly a great time, in fact it was such a great time we are planning on doing another battle sometime soon. Stay tuned in our Events Page to see whats happening next. Until next time fellow Makers! Sugar, Spice, and Everything Unicorns!! Well guys we had a wonderful week last week and I’m excited to tell you all about it! Many of you have been to our classes and you know just how fun they can be. Last Thursday we held one of our Unicorn Cake Classes at the studio, and it was so much of a hit that the entire studio was packed! This class is such a fun one to attend because it really enchants the hearts of all ages, and we love teaching it since everyone can put their own twist on it too. At My Make Studio we really enjoy being able to teach our customers new things as well as getting your creative minds flowing so you can add your own unique touch to each of your creations. We can’t wait till our next Unicorn Cake Class happens because we know it will be a blast! In fact our next one is a Halloween Unicorn Cake Class, which will be spook-tacular! Stay tuned for more fun events at the studio, here on our blog or on our Events page. This Friday our newest instructor Mikaila Riehm, taught her first class for My Make Studio! It was a great turnout, with about a dozen people in attendance. Many of you may have been to our previous classes with instructor Chayla Turner, but this class was a bit different. Unlike our other classes, Mikaila taught everyone cake making 101 including how to shape, frost, and fondant the entire cake before decorating. Everyone loved it! Afterwards she gave them tip knowledge allowing them to create beautiful cakes. It was such a unique experience and many said they would be back with friends. She plans to teach another Cake 101 Class November 29th. Until next time, check below for some of the pics from the event.